The refs sucked - Yes they did. Missed goals, offsides that weren't there, really bad haircuts. FIFA's advertising totalitarianism - If you weren't selling Budweiser (The Official Beer of the FIFA 2010 World Cup!) you might as well be a crack dealer in the eyes of FIFA. One beer company responded by sending scantily clad women into a match. FIFA had the women arrested, though there is a rumor FIFA President Sepp Blatter wants to incorporate their outfits into the uniforms for the Women's World Cup. The big stars flopped - Rooney, Ronaldo, Messi didn't score. On the bright side, they all had better months than Mel Gibson and Lindsay Lohan. Director: Dos Equis, Scene 10, Take 1. Action. The Most Interesting Man in the World: I don't always drink beer. Sometimes, I drink orange juice. The Most Interesting Man in the World: Sorry! (to Crew) Sorry! (to Director) I was thinking about that bout of scurvy I had in '69. Director: OK, no problem. Once more from the top. Dos Equis, Scene 10, Take 2. Action. The Most Interesting Man in the World: I don't always drink beer. On occasion, I'll have a V-8, or a Clamato. The Most Interesting Man in the World: I'm sorry, I don't know where my mind is today. Director: Dos Equis, Scene 10, Take 7. Action. The Most Interesting Man in the World: I don't always drink beer. For example, I'll drink cranberry juice if I'm having a problem with my bowels. Director: Dos Equis, Scene 10, Take 11. Action. The Most Interesting Man in the World: I don't always drink beer. Sometimes, I'll put warm soup in a mug and sip it slowly. The Most Interesting Man in the World: I like the way the noodles tickle my moustache. Director: Dos Equis, Scene 10, (deep breath) Take 15. Action. 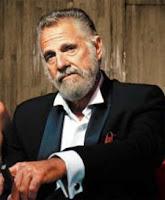 The Most Interesting Man in the World: I don't always drink beer. Sometimes I'll go weeks without one, even months. Often, I don't want a beer at all. In fact, sometimes the taste of beer makes me want to vomit. Assistant Director: (under his breath) Why'd you let him go on so long? Director: (under his breath) I thought he might get round to it this time. The Most Interesting Man in the World: Are we going to be much longer? I've got a monkey-bathing session at 3 p.m. and it's no fun if the water cools off. Director: (wearily) Dos Equis, Scene 10, Take 45. Action. The Most Interesting Man in the World: ...and when you're sewing yourself up without anesthetic, the worst thing is pulling the thread. I usually laugh when I do that, to cover up the crying. The Most Interesting Man in the World: I'm sorry, were we rolling? Director: Yes. Yes, we were %$&! rolling!!! Director: Don't even try that crap with me, now. Director: (breezily without the expectation of success) Dos Equis, Scene 10, Take 137. Action. The Most Interesting Man in the World: I don't always drink beer.But when I do, I prefer Dos Equis. Stay thirsty, my friends, and watch out for those bowel problems. Director: (Shocked) Cut! Print it! We'll fix it in editing. The Most Interesting Man in the World: Does anyone have any cranberry juice, handy?